There’s a new way to cruise the Mekong – but it’s the ancient wonders that make this part of the world so entrancing. Amid the rafts, boats, ferries and sampans on the Mekong, there is a gleaming new ship. Launched in September, Indochine II is all tasteful elegance. From the swimming pool on the sun deck to the massage room three floors below, the 62-passenger vessel has the feel of a modern European boutique hotel – though her gleaming balcony doors reflect lush tropical riverbanks and golden oriental sunsets. Owned like her older and smaller sister Indochine I by French company CroisiEurope, Indochine II glides between Siem Reap in Cambodia and Ho Chi Minh City in Vietnam (Croisi being the only cruise line to sail into the former Saigon). Along the way guests can take in ancient temples, the Tonlé Sap lake and the Cambodian capital Phnom Penh. The 32 crew, mainly Cambodian, are smart, polite and efficient, silently clearing away dishes and bringing new ones as a cosmopolitan collection of guests make new friendships over the linen-draped tables. Breakfast and lunch are buffet-style, while dinner is a sharing experience, with excellent set meals showcasing the local cuisine. British passengers are made to feel at home, with onboard announcements and tours in both French and English. Although most passengers are from France, you’ll also hear German and Spanish voices, while the English-speaking contingent is swollen by Americans and Australians. 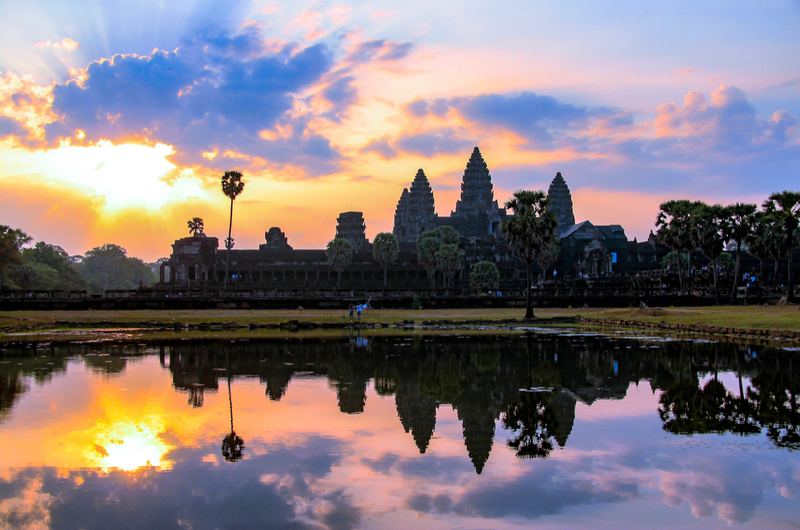 Our inaugural voyage began with a visit to 12th-century Angkor Wat, the world’s largest religious monument with its five lotus-shaped towers. Now a sight that tourists cross the world to see, for hundreds of years it was abandoned and only became famous in the West after a visit by a French explorer during the 19th century. Our visit coincided with a spectacular thunderstorm, and in seconds we were soaked, the downpour bouncing off the stones. Vendors selling ponchos for a dollar made a fortune. A child, possibly about ten years old, tried to sell me a second one. “Just one dollar,” he pleaded. “If you buy this, I will go to school.” He repeated the phrase, obviously aware of Westerners’ reluctance to buy from youngsters, as it encourages parents to send them on to the streets instead of giving them an education. After I declined, he headed off into the rain, clutching a bagged poncho over his head. Even savage showers do not last long in this part of the world, and the heat returned as we took gondolas on to the moat around the walled city of Angkor Thom, splashing our way gently towards the setting sun. Our evening’s entertainment that day was a mesmerising performance by the Phare Circus, a mix of acrobatics, dance, symbolism and a deeply moving story reflecting Cambodia’s troubled past. This, of course, is a country still recovering from war and genocide. Millions of landmines lie undiscovered in the countryside, and a third of the population was wiped out under Pol Pot’s catastrophic rule in the 1970s. Even today, many of Cambodia’s 16million citizens live in poverty. Yet in spite – or perhaps because – of this, it is a welcoming country for tourists. Arriving after a 12-hour journey from London to Bangkok, then another short connecting flight, the only trouble I encountered in Siem Reap, even late at night, was harassment from the drivers of tuk-tuks – those ubiquitous motorcycle rickshaws – touting for trade. I saw one cab painted black with Batman symbols. Now there’s a form of transport Bruce Wayne overlooked. Shops here are open-fronted and piled with goods, often with a sole trader sitting in front. In the market, along aisles barely wide enough to walk down, vendors sit cross-legged, waving away flies from their displays of meat with plastic bags tied to sticks. If your tastes are more adventurous, street vendors sell a selection of bugs – apparently just for tourists wanting to undergo their own “bushtucker trial”. The city’s incongruously named Pub Street – the clue is in the title – forms the centre of its nightlife and attracts the gap-year backpackers. But it’s wise to keep your wits about you as the streets are chaotic, with cars and bikes – often laden with goods or several members of one family – turning in all directions and competing for every available space, beeping and hooting all the time. Next day, away from the city, we found peace again at Ta Prohm. This 12th century temple is merging back into the surrounding jungle, with trees growing through its stones. If it feels like a movie set, that’s no surprise – Tomb Raider was filmed here. Later we explored Angkor Thom and the Bayon Mountain temple, before returning to the modern charms of Indochine II. 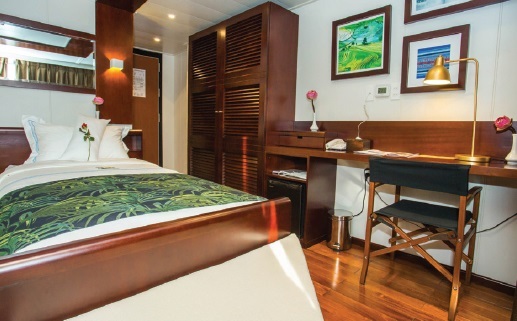 Each cabin on the 206ft-long Vietnamese-built ship has a private balcony, separate bathroom and loo, and plenty of storage, though few drawers. The sun deck, with hanging chairs and some double-width loungers, extends along to the lounge and bar, where sliding doors allow guests to take their drinks outside. Spiral wooden steps – there is no lift – wind down to the upper passenger deck, then to the main deck and restaurant. If you feel the need for a little extra pampering, masseuses work in the two-bed spa, offering 50-minute treatments including aromatherapy oil for $28 or less. To reach our first port of Kampong Chhnang, Cambodia, we had to cross Tonlé Sap, one of the largest freshwater lakes in southeast Asia. During the June-to-November monsoon season, this increases its area fourfold to 4,000 square miles, deepening from little more than three feet to as much as 45. Indochine II, like the four other CroisiEurope ships on the Mekong, operates between August and April. On our voyage, Tonlé Sap was more like a sea as we sailed past floating villages. Hundreds of people live in these collections of ramshackle homes built on bamboo rafts, the colourful houses joined to each other and the shore. Some children go to school here, but there is no rubbish collection or sewerage system – all waste is dumped in the river. From Kampong Chhnang, an excursion along dusty roads took us to a village to meet the remarkable Mr Ry. This 67-year-old still climbs palm trees to harvest the fruit for palm sugar and wine. He stores it in huge pots until he can get the best price. After reboarding Indochine II we headed on to Phnom Penh at the confluence with the Mekong as it makes its 2,700-mile journey from the Himalayas through six countries to a 15,000 square mile delta on the South China Sea. Another day, another tuk-tuk, as we set out on a tour of local landmarks including the Royal Palace and National Museum. Phnom Penh is also home to a chilling genocide museum inside the former S-21 prison where Pol Pot’s Khmer Rouge tortured, interrogated and executed prisoners. Of 14,000 people who entered, only seven survived. Bodies were buried in the notorious Killing Fields, where even now new bones surface in the scorched earth. 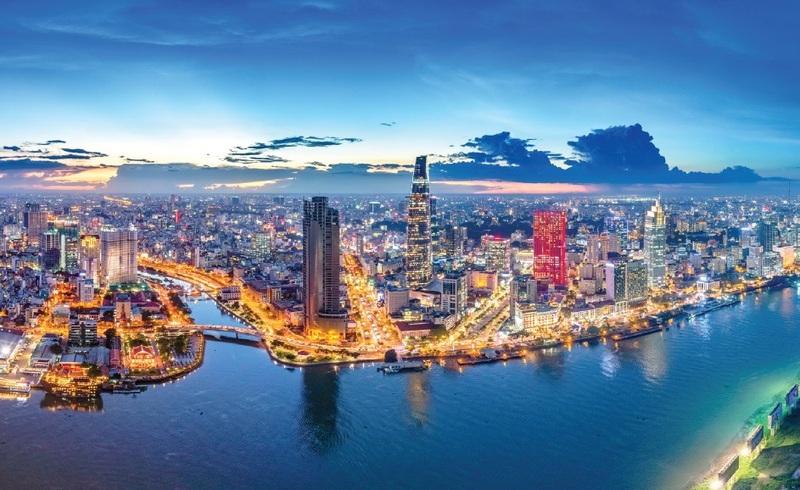 Leaving the capital, the voyage crosses the border into Vietnam, to Chau Doc, Sa Dec, Vinh Long and Cai Be, before passing through the Cho Gao Canal to Ho Chi Minh City, where guests can visit a beekeeper, tour a lacquerware factory or explore the Natural History Museum and Notre Dame Cathedral. For those who want to see more, a four-day extension includes a flight to Hanoi and a junk cruise on Halong Bay, around the thousands of limestone islands that dot these emerald waters. This is a beautiful, exotic part of the world to visit, although Cambodia in particular is still grappling with the legacy of its past. The hope is that, by contributing your tourist dollar, you can make a small contribution to giving its friendly, hard-working people a brighter future. 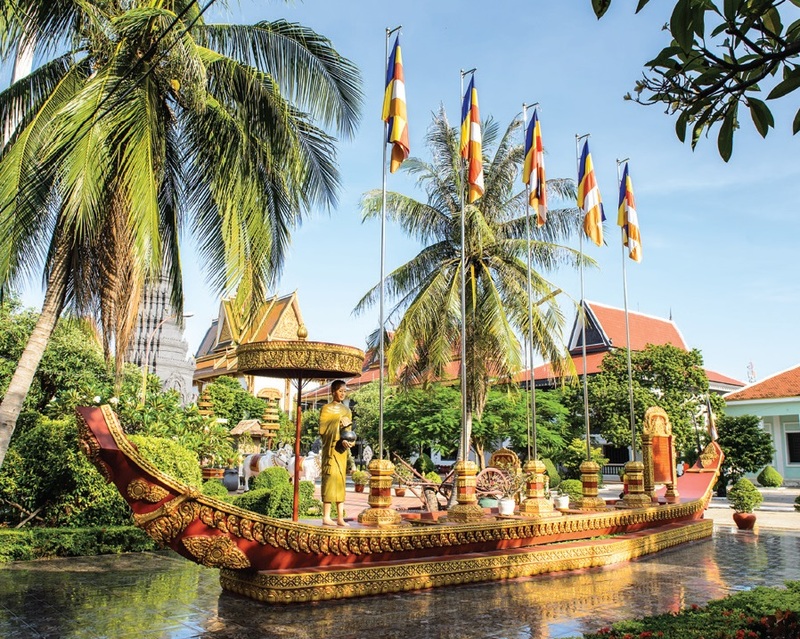 Cruises on Indochine II cost from £2,460 (cruise only). Tours, soft drinks, wi-fi, hotel accommodation in Siem Reap and one alcoholic drink with onboard meals are included in the fare. Gratuities are covered for the crew but not for all the guides and drivers. See croisieurope.co.uk, 020 8328 1281.